Photography is all about light! One of the major characteristics of light we depend on in photography to communicate is color, be it one band or its entire spectrum. In conventional film capture, while most photographers are aware of this basic fact, most take for granted the color temp of the light falling on their subject and how their film might react to and render it. But more to the point, honest, exact, faithful color rendition has never been a real major point of contention for most conventional photographers. When digital still photography came along for the masses, the attitudes about color temp from conventional photography carried over to digital even though the major characteristic of light we still depend on to communicate is still color. But being unaware of color temp and white balance, both that of the light falling on the subject and the setting in which you've set the camera, can no longer be taken for granted! While exact color rendition might not still be the number one priority, getting real close probably is. There are definitely two camps when it comes to how to achieve the correct white balance in digital photography. The first camp is getting it right right when you take the photo and the second is fixing the color balance after the fact in the computer. As you might as well have guessed, I'm in the first camp, I demand of myself that I get it right right from the start (I'm still from the old school definition of what is a photographer). I don't have the luxury of time to mess with images in post-production. But is it possible to get it right right from the start with current digital camera technology? If you're shooting with the Canon 1D, you bet! You can dial in exactly the white balance you want for the color temp of the light falling on the subject. You can do this in increments of 100k which is really nice! If you're shooting with the D1 family of cameras (including the D100) you don't have this option of dialing in an exact white balance number. Instead we're stuck with the preassigned numbers the silly little icons offer us (leftover conventions of video cameras). But you might be surprised by what you can do and how close you can come to perfection with some simplistic understanding (which is the only way I can operate) and application of what is available to us. UPDATE: Cool Products that can help you get your White Balance Right! Since we published this article the industry has responded to the need for products to help with your white balance in a big way. First and foremost is the very handy little SypderCube. 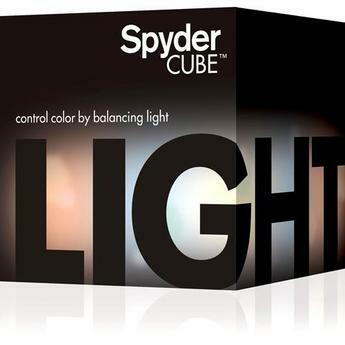 This device allows you to shoot the carefully designed cube and get white, black and color temperature quickly and easily. You can read our review of the SpyderCUBE online or jump straight to B&H where you can order one for under $50. For a more sophisticated approach you can also build custom camera profiles which include white balance settings using the Colorchecker Passport from X-Rite. You can read our full review online. Look for more products which help you build camera profiles for Adobe Camera Raw in Photoshop and Lightroom to be hitting the market soon. Here's a brief primer on color temp (to learn more, head to http://www.schorsch.com/kbase/glossary/color_temperature.html for the abridged version or http://cybaea.com/photo/color-correction.html for a whole lot more). Daylight, light falling on the Washington Mall on clear, fine beautiful day on the 4th of July was rated at 5500k. This has been our bench mark for daylight Kelvin temp ever since (your conventional film has this color temp rating). It's from this number in which our conventional film was based that everything we do with digital has been based (not the best of systems). Here's the same basic information but in a chart which has film type, color correction filters and color temp. This chart is for conventional film, but you can use it for digital to get a feel for color temp / white balance if you don't know numbers already. The way to use the chart is to use a ruler to "draw" a line from film type (WB setting) to color temp and where it crosses the middle graph indicated the filtration required to match the WB & CB. A (Auto White Balance): automatically adjusts the white balance between 4,200 and 7,000k. Incandescent: The color temperature of this setting is basically fixed at 3,000k. Fluorescent: The setting is fixed at approximately 4,200k. Direct Sun: Color temperature is fixed at approximately 5,200k (even though basic sunlight is 5,500k). Flash: Its color temperature is set at approximately 5,400k (even though flash is 5,500k). Cloudy: This setting is obviously for overcast light. Its color temperature is set at approximately 6,000 K.
Shade: The color temperature is set at approximately 7,000k in the D1 and 8,000k in the X/H. You can fine tune these numbers and either increase or decrease them depending on your needs. With the D1 you can make fine adjustments to these preset numbers (depress the WB button and rotate the sub-command dial to access) in these increments. And for the D1X/H (depress the WB button and rotate the sub-command dial to access or through the menu system) you have these options which are slightly different from the D1. The goal in our everyday digital photography is to match to the best of our ability the color temp of the light falling on the subject with the white balance settings of our camera (or if being creative, not matching them to taste). But here lies the challenge because most photographers don't know the color temp of the light falling on their subject let alone able to match that with the rigid white balance settings we have available in the D1 family. I'll tell you what I do, I simply shoot 99% of the time at Cloudy -3 and move on. But I have the sinking feeling that for many of you, that's not good enough so I'll continue (but you will more than likely come back to this setting yourself)! It is very important to understand that we are communicators and that we are human. Humans are into color, it pushes a lot of our buttons! This combination demands we use color either accurately or artistically (which can be one in the same or not) in our images. We first must recognize and acknowledge what is our subject and the subject's natural color. We then must recognize the color temp of the light falling on our subject, and then use the numbers available to us in our camera to capture the most accurate white balance. (Keep in mind that you might have to be doing this in a split second if photographing action and you haven't already established your own preferred setting, you could miss the shot). This is the most simplistic approach and application of white balance and is the bases of my workflow. Many have asked about the effectiveness of carrying around a color temperature meter to take some of the guess work out of this equation. I used a color temp meter for years long ago in my commercial days and got very good at using it, knowing how to prevent my clothes for example from biasing the reading, etc. I grabbed one again when I first received my D1 in my initial attempt to get a handle on the D1's WB. But because we have such a limited range of WB settings to work with in the D1 Family, knowing I was shooting at 9800k did no practical good. In getting it right right from the start, some of this is "flying by the sit of your pants" photography. Keep in mind I always work on the KISS theorem, I strive to eliminate as many "problems" so my concentration remains on the subject! But what about Auto, shouldn't that setting with it's variable range work better, make our life and photographs better? I'm here to tell you, Auto WB is the last option you should use! When I hear digital shooters tell me they have their cameras set to Auto WB, I know they haven't done their homework and are causing themselves ultimately more work (I'm amazed how many NEF shooters shoot on Auto WB and then wonder what's wrong with the color of their previews. All of that info and the wrong WB)! I've yet to shoot with any digital SLR, Kodak, Canon or Nikon that had a Auto White Balance that delivered what I desired let alone close to what the subject required. Why? In a nutshell, keep in mind that our CCD's captures B&W with color being added on the image's path to the CompactFlash card. To really over simplify the problem, in that path, something gets lost in the translation. Because of the genius of my partner, we now can actually see the white balance the D1 Family is setting when the camera is set to Auto. 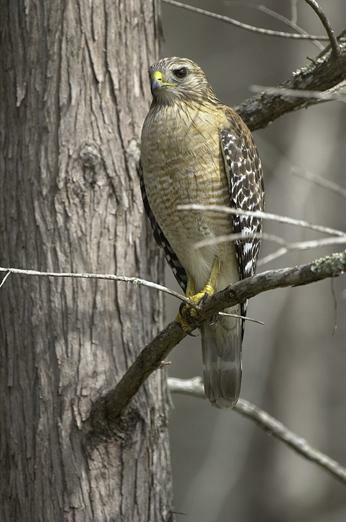 The two images that follow of a Red-shouldered Hawk were captured with the camera set to Auto-3. You can see visually the vast difference in the color balance between the two images. This despite the fact that the images were taken within microseconds of each other. The image on the left, DigitalPro reports the camera set the white balance to 4589k and the image on the right at 5477k (you will only find out this info by using DigitalPro). It looks as if the sun came out in the image on the right when in reality, the white balance just got closer to the correct color temp. (Don't confuse this with the problem with Tone in the X/H.) This is a common problem with Auto WB and a visual demonstration why that's the worst WB setting you can select! I realize that goes in the face of common logic and what I said when I first started to shoot with the D1 three years ago. But the proof is in the pudding. So.I come back to what I said in the beginning, Cloudy -3 comes the closest to our everyday shooting color temp / white balance needs. You can mess around with other settings but in the end, to get it right right from the start, this is our best option right now. How can you learn color temperatures? That's a darn good question now isn't it. The answer is of course you can, but do you really need to? Color temperature of light is pretty predictable within a certain range of error. That's to say that we know that on a basic sunny day, the color temp can be within the range of 5500-7000k. So see, you can learn color temperature, there's your first lesson. The real question is, is it important to know specifically within that range the exact color temp to be able to match it with a D1 family setting? Heck no! Even if you had a color meter and could work it to get an accurate reading, looking at the tables above, you can see our inability to match a reading to a setting exactly. So your ability to be able to exactly know color temp might not really get you that much farther down the road. But we're talking your basic sunny day, that's really cheating as that's the easiest. What about outside that range? Most white balance problems for photographers come from color temps when there is no visible sun. Sunrises and sunsets, cloudy and overcast days and altitude are times when the color temp can spike in either direction of our baseline 5500 K. The first light of sunrise might be in the 2000k range where light right outside my door at 8200 feet elevation I have measured at 18000k! 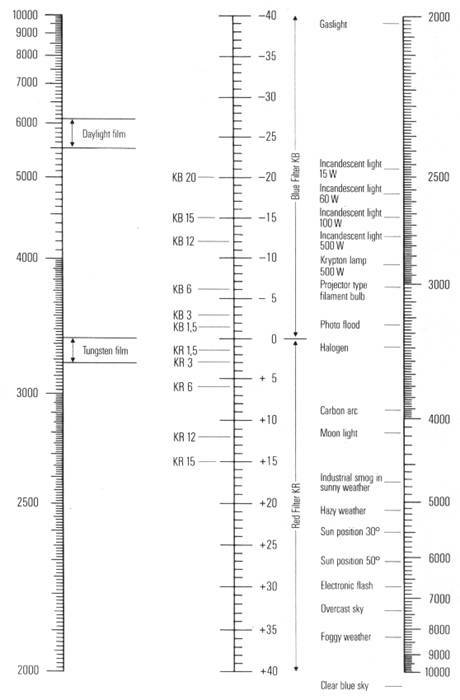 Here's a simple chart of round numbers coinciding with light sources. Now as I see it you have really one of two options. You can take the easy way out (I highly recommend it) and simply learn the generalities of color temperature by knowing the info I've gathered in the chart above or you do what I did to compile the chart, that's spend time and money with a color temperature meter. Why did I run around for years with a Minolta Color Meter to compile this trivia in the first place? When I did commercial work, I would often have to gel the strobes so they would match the color temp of the ambient light so the use of the strobes would not be apparent. I don't do that work any longer thank goodness! Many ask, "can't I just learn from what the LCD monitor displays?" The last reference for color temp / WB you should use is the preview monitor on the back of any digital camera! Their accuracy leaves much to be desired. Can you then trust your computer monitor to display the correct WB of your digital images? Man..is that a loaded question and one I'm not going to get into. I know I can trust my monitors but that's not a blanket endorsement that everyone should trust theirs without some homework at the very least. Then what about making prints to learn what is and isn't correct WB? That's just as bad as the monitor question for evaluating correct WB. May be in the future David can write a piece on these two topics but for right now, I'm not touching them other than to say, they're not your best options! It's a well known fact that I use an 81a filter (Nikon A2) on all of my lenses all of the time. I did this always with conventional film but many wonder if I do it with digital? It hasn't changed, I still use and 81a filter all of the time on all of my lenses. But doesn't digital "see" this color correction filter and "filter" it out so it has no effect? When you first come into digital photography, this logic makes perfect sense but that's not how it works, thank goodness! You can do the test for yourself, but if you shoot one image with and one image without an 81a filter attached, you will see the 81a image being "warmed" up. That's the purpose of the 81A filter, to "warm" up the scene or remove blue from the spectrum of light. In rough terms, when shooting in 5500 - 6000k light, the 81a filter is equal to adding about 800 - 1000k rating to your film. In other words, the color correction abilities of the 81a permit a 5500k WB to properly record a color temp around 6500k. This is the technical reason why I use the 81a filter, always have and always will (until I can dial it into my digital camera). But there is an even more important reason why I use the 81a filter. The Psychology of Color (www.moose395.net/howto/color.html) is something that was pounded into my head long ago back in the days of fashion and advertising photography. While I'm not in that spectrum of photography anymore, I am still selling something with my images. 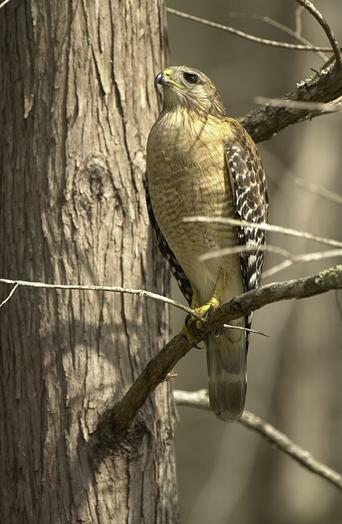 I'm trying to get folks involved with their wild heritage, I'm selling them on its worth and why it should be protected. The 81a filter permits me to grab folks heartstrings on the most basic of levels. Read the article on The Psychology of Color, it might influence your use of color! Where does flash come in? This is really a darn good question that with the D1, many including myself didn't want to consider. Since the D1 made flash such a pain to use, using the flash's constant 5500k (the flash's bulb temp when brand new, it slowly changes color temp with time) to "clean up" color wasn't really a fun option. With the improvement of flash with the D1X & D1H the option of flash to clean up colors is back again. What do I mean when I say "clean up" colors? This comes back to conventional film theory which can be applied to digital. The best way to explain it is to explain how I use it for my photography. When a butterfly thought to be extinct was rediscovered, I was there to photograph it. The male butterfly is a very specific blue which I needed to accurately record. The butterfly that was rediscovered lives in Los Angeles where the smog can radically change the color temp from day to day. This color temp change made it impossible to accurately record the blue of the butterfly. To accomplish the job, flash fill was used with its constant 5500k being the light source "cleaning up" the ambient light color temp. This constant color temp permitted me to accurately, frame after frame after frame, record the blue of the butterfly. This same thing can be applied to digital, but the question arises, do you set your camera WB to Sunny, Cloudy or Flash for the utmost accuracy? After all of my testing and David's number crunching, there isn't one setting that is going to give you anymore accurate color clean up over the other. I still use Cloudy-3 when doing flash fill outdoors and find those results to be the best for my needs. This is by no means the last word on white balance! This is at best a starting point which in time will change. It will change in time because of your own requirements and how they might change and how you might solve them. It will change in time as technology comes along to improve and change things. I personally don't think there is one perfect answer at this time for white balance and color temp. I do think though you can easily create the images you want to create with the correct white balance you require. I know you can do this with the information I've provided here and a little thought on your part. Go out with this information and paint the world red! David adds--In addition to Moose's empirical results, there are two good scientific reasons to consider using an 81A on a digital camera if you want warmer images. First, the 81A is applied before the image is captured, not after. That means that you are using the 12-bits of your camera's exposure in a more effective way than by having the white balance conversion change the sensor values any more than they have to after the light has hit the sensor. Second, the D1X and D1H are least sensitive to Red. So the Red channel needs all the help it can get. If we ask the camera to 'multiply' the red values by too much then we're adding noise we don't need to--and can prevent by proper filtering before the shot.